Cruise in luxury aboard the Cuan Law, the 105 foot trimaran custom-built for sailing in the Caribbean. Enjoy gourmet breakfasts, lunches and dinners aboard our home for the week, complete with fresh, locally-sourced ingredients. After dinner, play some group card or board games or sip on a nightcap from the boat’s bar. Bring your book and chat with your cruise companions as you get to know each other. A stunning view of Little and Dog Bays on the BVI of Virgin Gorda in the Caribbean sea under a dramatically clouded sky. Swim and relax amidst the white sand beaches and gentle warm waters surrounding Tortola, Virgin Gorda and neighboring Caribbean islands. Wander through caves at the Baths, natural rock formations in Virgin Gorda. Arrange with our hosts on the Cuan Law to scuba dive where you can explore the coral reefs and marine life thriving throughout the Caribbean's waters. Watch for wildlife by sea and on land such as this iguana taking in the view of turquoise waters. Life just wouldn't be right without some delicious appetizers on the deck of our fabulous trimaran! Take in the sunsets each night and remind yourself how lucky you are to be sharing this escape with your new AdventureWomen friends! These adventures exercise your mind more than your body and are designed for women who prefer a leisurely, less rigorous experience. For example, you could walk up to 2 miles per day through cities and villages, stand in museums for a few hours, relax on a boat, or view wildlife from a vehicle. Learn more about activity levels. You’ll set sail from the BVI island of Tortola, a paradise of white sand beaches, lush mountainsides, and crystal-clear blue waters. Your adventure takes place aboard the Cuan Law, the world’s largest trimaran yacht, whose three hulls stretch to 105 feet. Huge white sails will whisk you across the waters, but you’ll never miss the comforts of home. Wander the wide expanses of the sunsoaked top deck with some of the fascinating women sharing your journey, then return to your luxury yacht stateroom with private en suite bathroom to unwind. Get to know one another over gourmet meals and a daily cocktail hour with delicious hors d’oeuvres. From the moment you wake up until the moment the waves rock you to sleep, the expert staff aboard the Cuan Law will ensure all your needs are met. Of course you won’t want to stay below decks once you see the stunning expanse of the Caribbean unfolding beneath you. You’ll make stops at several of the BVI’s islands, where you’ll be able to luxuriate in the stunning scenery and the feeling of warm sand beneath your feet. At Virgin Gorda you’ll have a chance to visit The Baths, an incredible rock formation where huge boulders give way to pristine hidden sea pools filled with tropical fish. Explore the caves at Norman Island, believed to be the setting for Robert Lewis Stevenson’s Treasure Island. Maybe you and some of the adventurous women sharing your journey will manage to uncover some of the pirate treasure rumored to be buried there! Daily opportunities to snorkel and scuba dive (if you’re certified, you can dive right in; if not, lessons are available!) will open up a world below the waves, filled with vibrant tropical fish and extravagant corals. Feel the breeze on your face on a sea kayak, or even sail a Hobie Cat, a small catamaran that will whip you over the surface of the water! You’ll adore the perfect blend of warm relaxation, island exploration, and aquatic adventure on this luxurious sailing journey through the British Virgin Islands in April 2019. Read our guest reviews of our trip on the Cuan Law from 2015! Live aboard a privately chartered luxury sailing yacht in the Caribbean – just for AdventureWomen! Sea kayak, explore the beaches, and soak in the Caribbean sun with your AdventureWomen friends! Powdery white-sand beaches, lush green mountains, and sheltered, yacht-filled harbours characterize the island of Tortola, the BVI’s largest and capital island. Arrive in Tortola this morning (or a few days early if you like)! You can board the boat between noon and 3:00pm, so be sure to arrive early enough to make your way to the boat. AdventureWomen will arrange a taxi transfer for you from the Tortola Airport, the Tortola ferry dock, or a Tortola hotel to the boat. These will be arranged roughly a month before departure. Board the Cuan Law, your home away from home, between noon and 3:00pm. Meet your group and AdventureWomen Ambassador. Sit down to a delicious dinner as a group and enjoy the sunset from the boat. When you hear a bell, it’s either time to snorkel and dive (all dives operated by the Cuan Law), or to eat! Mornings begin with a delicious buffet-style breakfast including coffee, fresh fruits, homemade muffins, breads, pastries, as well as a hot meal. Before breakfast, however, there are opportunities to take out a sea kayak for an early morning paddle, or just sit on the deck and watch the sun come up over the turquoise Caribbean waters. After breakfast, set sail to find a beautiful spot to anchor. With an abundance of vibrant shallow reefs and intriguing caves, you’ll have plenty of opportunities to grab a mask and snorkel or to scuba dive to investigate the marine world. Masks, fins, snorkels, and flotation vests are part of your package. There are dozens of anchorages and over 100 dive sites for scuba divers and snorkelers. The itinerary of the boat varies from week to week, depending on the weather, and the whims of the captain. Lunch is served under the shaded rear deck canopy. Between meals there are plenty of snacks including chocolate goodies, fresh fruit, and delicious hors d’oeuvres in the afternoon. After lunch, you’ll begin sailing to your anchorage where the boat moors for the night. Once you arrive there are more opportunities for snorkeling or scuba diving. You might also want to go ashore. Sandy white beaches are not to be missed, especially on the day of the special beach barbecue at The Baths on Virgin Gorda. The Baths is a unique rock formation of huge boulders and hidden sea pools. The crystal blue waters and many pools filled with tropical fish make this area a popular snorkeling and scuba diving spot. Legend has it that pirates’ treasure was discovered on Norman Island around the turn of the century. Believed to be the Treasure Island of Robert Lewis Stevenson’s book, the Caves at Norman Island are a great place to dive and snorkel. The steep cliffs drop down as deep as 40 feet and are home to fish, sponges, corals, and shrimp. Dinner is a classic sit-down event with china and crystal, and is the culinary highlight of the day. A savory blend of international cuisine and hearty island cooking are complimented by a selection of fine wines. Make sure to save room for desserts such as Key Lime Pie and Brownies Fantasia. After dinner you might play some games as a group, or watch the sun go down as you sip a nightcap from the boat’s bar. Scuba divers can choose to do an exciting night dive, an experience that you won’t soon forget! 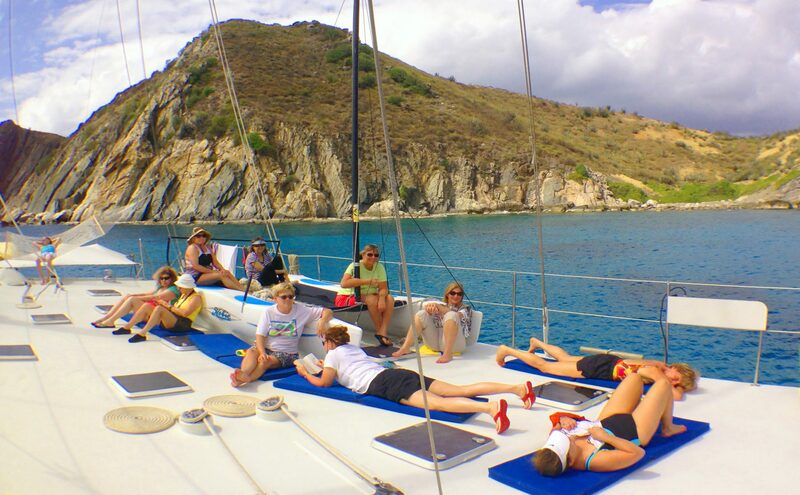 Enjoy one last morning on the boat before docking in Tortola. Head home, or perhaps spend an extra night or two on Tortola. If you are planning to scuba dive, please plan your flights accordingly. Dock in Tortola around 10am, and do some shopping before you have to head to the airport. AdventureWomen will arrange taxi transfers for you to the airport. If you have a late afternoon flight, you can store your luggage on the Cuan Law until your departure. Arrive: Arrive in the British Virgin Islands (EIS) on April 7, 2019 by 1:00pm. Depart: Depart the British Virgin Islands (EIS) on April 13, 2019 after noon. You are required to arrange your scuba diving upon arrival directly with the Cuan Law. AdventureWomen cannot arrange this for you ahead of time. If you arrive as a non-scuba diver but want to learn, the instructors on Cuan Law offer a Resort Course and a one-week PADI certification course. The warm, clear waters of the BVI serve as your classroom and open water test ground. Many women do their PADI course work and pool work at home, and then bring a referral letter from their instructors to do their four open water dives and get certified on the Cuan Law. This is a great way to get your “C” card! (Read “a”, “b”, and “c” below), and the Cuan Law recommends this as the best way to get your diving certification. If you are already a certified diver with a “C” card, then you have the choice to follow a dive guide or venture off on your own. You handle your tank as little as possible. Set up your tank for the first dive and the crew handles it from there. You simply step up to the waist-high tank deck, where a crew member has your tank waiting for you to slip into your BC. From there you either giant stride off the aft deck or board the inflatable. After the dive you step up to the tank deck and your tank is taken by the crew to be filled for the next dive and stored out of the way. Tanks with BCs and regs in place are stored on the back aft deck out of view of the canopied aft deck.Masks, snorkels, and dive accessories are stored conveniently in dive bins located under the seating area. This keeps the dive deck from becoming cluttered. The Cuan Law will always provide a full tank. Below deck, there are two air compressors efficiently pumping the 3,000 psi aluminum 100s, 80s, and 63s. The dives operated by the Cuan Law are generally not deep or demanding, with the majority being shallower than 80 feet. Resort Course students will be diving not more than 40 feet. Surface conditions are normally quite calm, and the 8-10 inch tidal range does not usually generate the swift currents found elsewhere. An advantage of diving aboard the Cuan Law is that the Captain won’t hesitate to crisscross the islands to put you into the best dive conditions each day. You will see a year’s worth of critters and coral no matter where you dive, or how deep. Caribbean reef sharks, manta rays, and spotted eagle rays are not uncommon, but the BVI is most known for the incredible diversity of reef fish. Since the BVI is protected under the National Parks Trust, several special areas, such as the wreck of the Rhone, receive extra protection as marine parks. As a result, divers enjoy healthy reefs with an enormous variety of fish. Visibility is normally in the 60-100 foot range, with occasional days of 120 feet at some sites. Two to three dives are planned each day, including a morning dive after breakfast, an afternoon dive after lunch, and a night dive, dependent on your anchorage. Most dives are made from the two 20-foot, 85 hp custom rigid hull inflatable boats. Cuan Law is almost always anchored in flat, protected water and since the dinghies slide conveniently into “parking spots” on each side of the Cuan Law’s center hull, boarding is easy. At the dive site, divers simply back roll into the water from the normal sitting position. Getting back into the boat is almost as simple. A sturdy stainless steel ladder with wooden steps folds down from the transom, extending about 4 feet below the surface. The inflatables are manned continuously during dives so you are always assured of a quick pickup, no matter where you surface. With both dinghies in the water and the Cuan Law anchored over a dive site, three different locations can be dived simultaneously, ensuring that you won’t have to dive with a crowd. The dinghies are also used for shore expeditions and snorkeling. The Cuan Law’s PADI Discover Scuba Diving program allows those who have never tried diving to safely experience the same sense of wonder and excitement shared every day by scuba divers throughout the world. Under the careful supervision of a PADI instructor, participants actually go on up to five scuba dives in shallow, calm water of no more than 40 feet. The cost for the week is only $145 including gear (payable directly to the Cuan Law). You will need to bring a wetsuit (best to rent it from home). There are very few available on the boat, and most likely not in your size. If you decide that you would like to get certified, then the next thing to do is go home and do your pool and classwork (see below), and return the next year with a letter of referral. Then get certified on the boat by completing your 4 open water dives on the trip. Many AdventureWomen have become PADI certified divers by doing this (see “b” next). your vacation time in a “classroom.” The cost of this course is $220 (payable directly to the Cuan Law), rentals not included. If you do your course work and open water pool work at home, then the Cuan Law recommends getting certified and earning your Open Water Certification (below) on the boat. Being certified (getting your C-card) as an open water diver enables you to buy/rent Scuba equipment and dive without direct instructor supervision. The Cuan Law does not suggest you do this entire course on the boat, as you will not have time to have fun! The Cuan Law recommends coming with your “referral” (option “b”) as the best way to get your certification, as you will have already done your time-consuming course work and pool work at home. Once you have your “C” card, this next step develops skills and introduces you to night diving, deep diving, underwater navigation and 2 to 6 other specialties you and your instructor choose. The cost ranges from $75-120, payable directly to the Cuan Law. We rate this trip as Moderate. Our Moderate adventures exercise your mind more than your body and are designed for women who prefer a leisurely, less rigorous experience. For example, you could walk up to 2 miles per day through cities and villages, stand in museums for a few hours, relax on a boat, or view wildlife from a vehicle. Make an appointment with a travel clinic. There are no immunization requirements for travel to the British Virgin Islands, however your local travel clinic may have recommendations for you based on your age, health, and past vaccination history. For more health information, go to www.cdc.gov/travel and navigate to the page about the British Virgin Islands. The currency of the British Virgin Islands is the US Dollar. You will be able to use your credit card to pay for extras on the boat (rentals, scuba courses), and you should also bring some US cash with you. Suggested Gratuities: Gratuities are included in your trip. Final payment is due to AdventureWomen in a cash form (check, money order, or wire transfer) on or before December 15, 2018. The Cuan Law, our home away from home, is not like any other sailboat you’ve ever seen. Custom-designed for luxury live-aboard scuba diving, sailing, snorkeling, or just plain relaxing, the trimaran is 105 feet long and 44 feet wide. Two 110-foot masts spread 5,200 square feet of sail over the massive deck. Her size and tri-hull design provide extreme stability, both at anchor and while underway. With a captain and seven crew members at your service, plus three meals a day, you’ll feel comfortable and very pampered for the week, from the minute you set foot onboard. The accommodations aboard the boat are spacious and comfortable. There are ten large double staterooms, each with twin beds which can also be made into one large bed. Every stateroom is located directly off the main lounge so that it has an outside view. Storage space is abundant with shelves and two large drawers per guest, as well as a hanging closet in each room. There’s even space for hard suitcases under your bed! Cabins are fully air conditioned, with a thermostat so you can adjust to your desired temperature. Two hatches give you the option of natural ventilation, along with splendid views. All staterooms have a private bathroom with a shower and a toilet that works just like the ones back home. Fluffy towels and quality linens add the finishing touch. There is a standard 110 outlet, and every bathroom contains an overhead hatch. Safety requirements demand that each room on the ship has two escape routes, so all hatches are person-sized. The spacious salon is the social hub aboard the boat, with cabins arranged in a U-shape around the front and sides. This common area serves as a central gathering place for guests and crew. The atmosphere is bright and cheery. Large sofas, tables, and easy chairs provide plenty of places to lounge, read, or take an afternoon nap. There is a library of books and magazines available, and a movie room for DVDs. Overhead hatches let in light, and central air conditioning keeps the room cool and dry. Life aboard the Cuan Law is informal and fun. Casual clothing is the norm - you’ll live in bathing suits, shorts, t-shirts, and sandals all day. At dinner guests are asked to put on a “smart” blouse and shorts, a colorful wrap, or a casual dress or skirt (no jeans or bathing suits please). What guests are saying "British Virgin Islands Cruise: Sailing, Snorkeling, & Sea Life"
"My musings on what was the best part? #1, without hesitation, was to be in the company of 13 smart, FUNNY, interesting, warm, loving and all around incredible women, in a situation where bonding was immediate and without hesitation. We never competed, we never judged." Virtuoso has released its 2019 Luxe Report examining the top trends in luxury travel based on their survey of the company’s 17,500 travel advisers. Five travel trends emerge which are all anchored in an ... Read more.